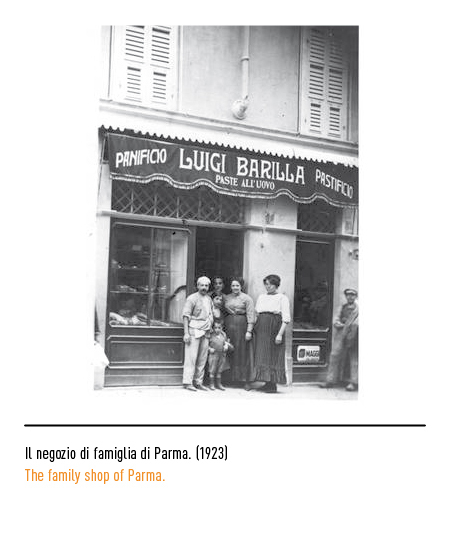 The firm was established in 1877 by Pietro Barilla, heir to a family of bakers dating as far back to as 1576. 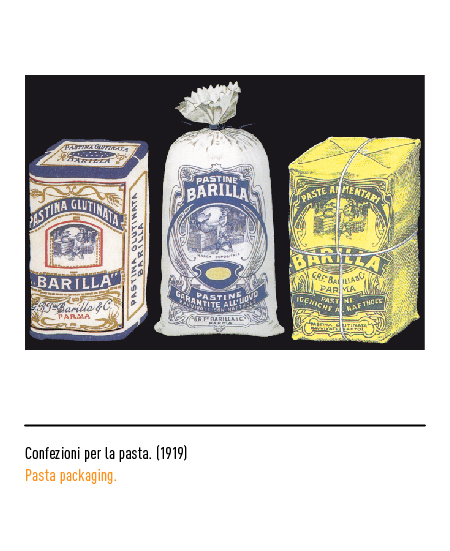 His first facilities included a bakery for the production of bread and a workshop for the working of dough to make pasta. In 1910 a new establishment for making egg pasta was opened and on this occasion it was felt the time had come for the firm to be given a clear graphic identity. 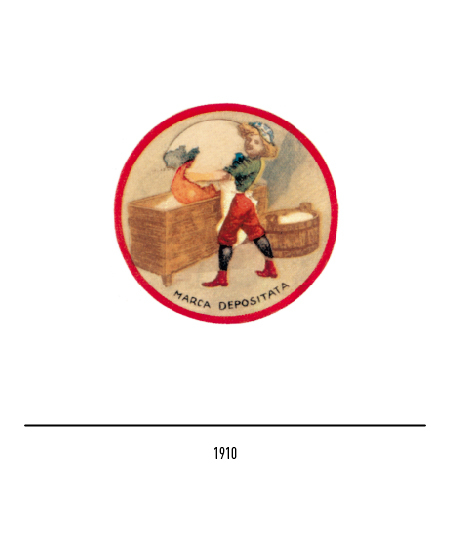 The first trade-mark was designed by Ettore Vernizzi and portrays a baker's apprentice, called "al putén" in the local dialect, within a circle in the act of pouring an enormous egg yoke into a heap of flour in a kneading trough. 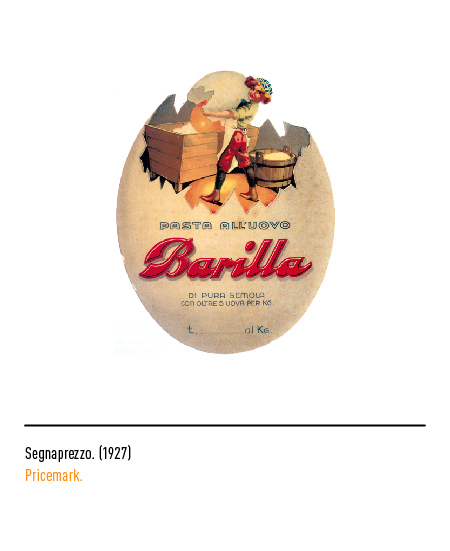 The focus of the whole scene is the egg yoke, symbol of life and abundance, depicted "larger-than-life" for utmost visual impact and message communication at a glance. 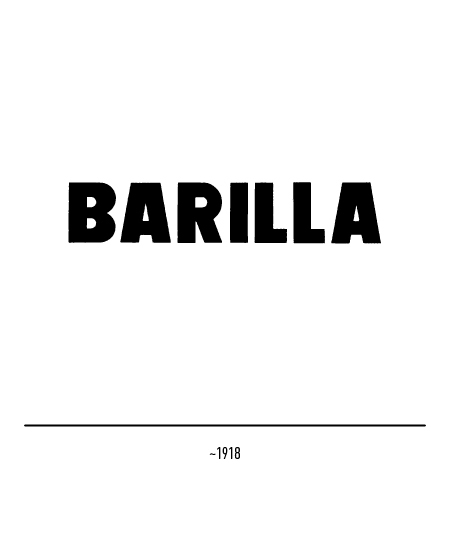 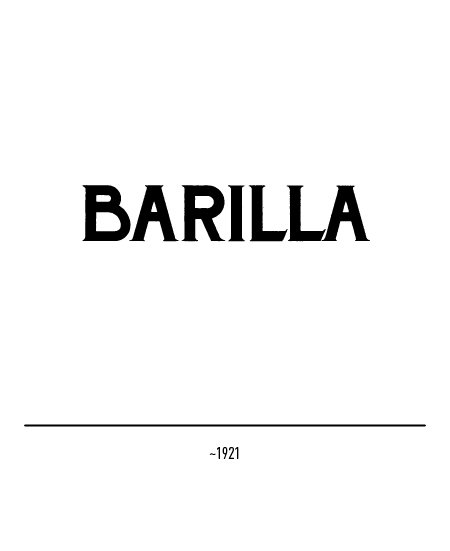 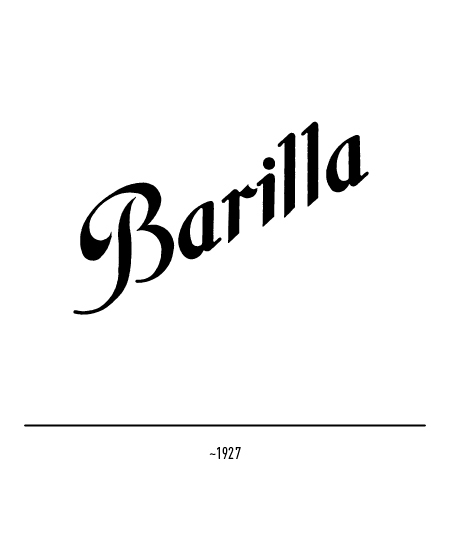 The device was used up to the thirties on letter-headed paper in conjunction with any of range of Barilla logotypes, some with the sinuosity typical of the art nouveau style, others, solid and block-like, more in the vein of twentieth century modernism. 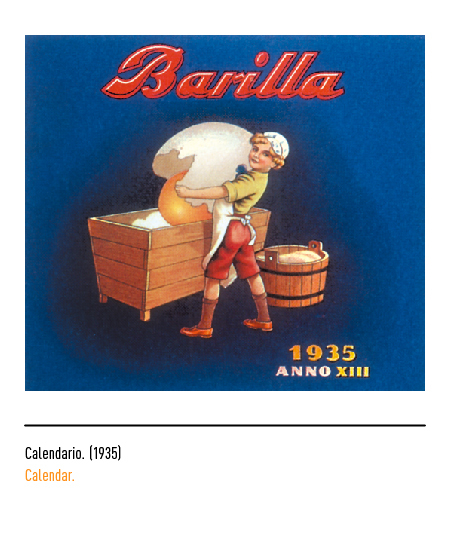 In 1936 Giuseppe Venturini deleted the apprentice boy leaving only the "verbal" motifs cut out as if from tin sheet. 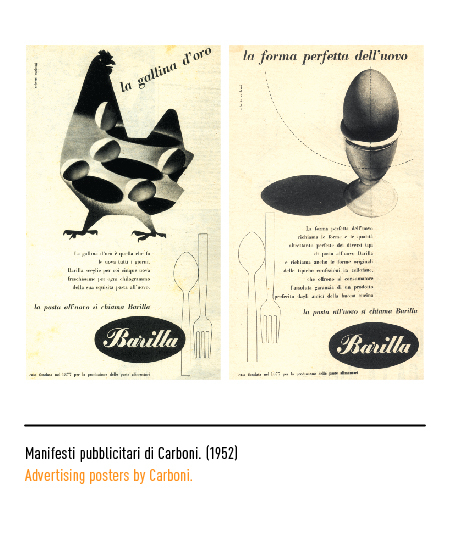 These he then framed within an oval border line in 1949. 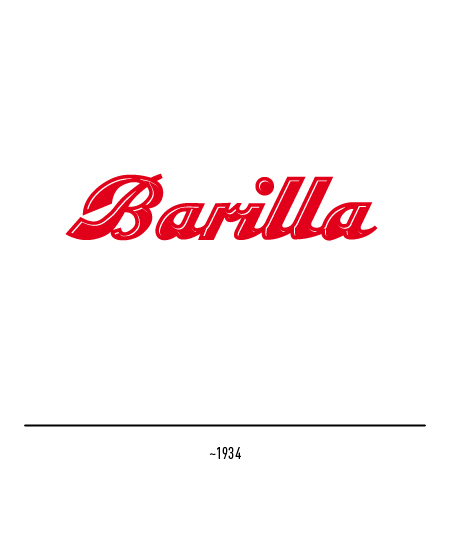 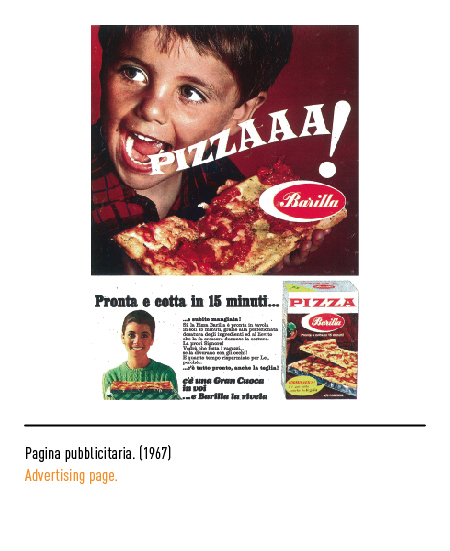 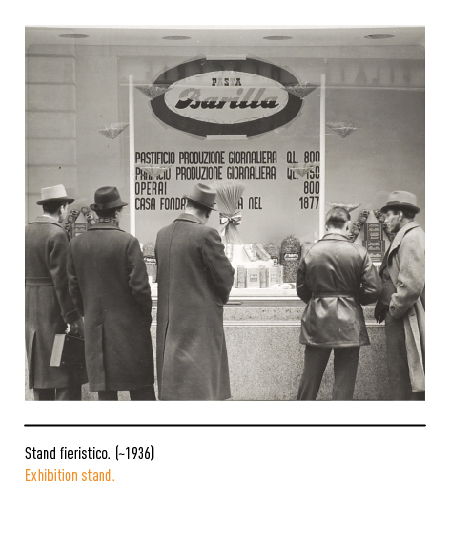 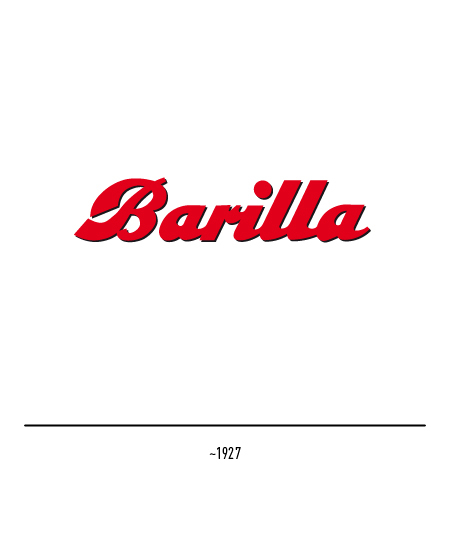 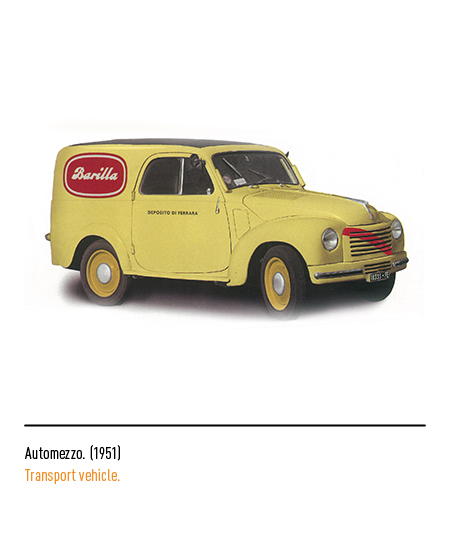 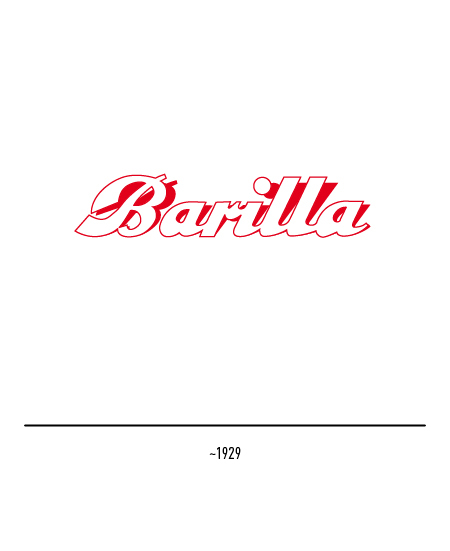 During post-war reconstruction Barilla concentrated on the industrialisation of bread making, initially in Italy, and on mechanising pasta processing, set up a modern and capillary sales network. 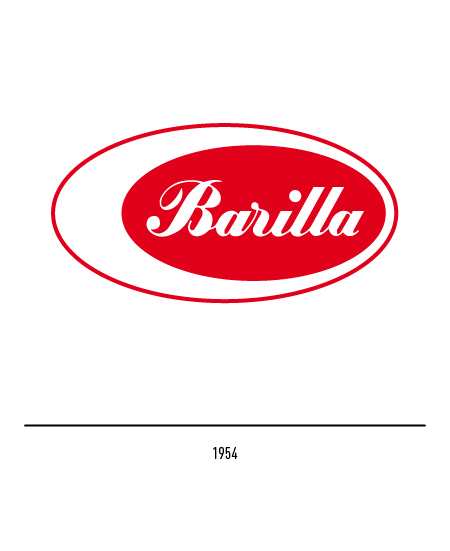 In 1952 the bakery side of the business was discontinued and production focused on semolina and egg pasta. 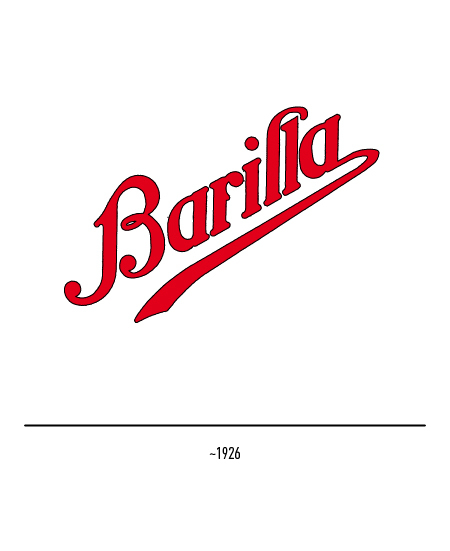 A new logotype was hence designed by Erberto Carboni framed by an oval figure, in the positive and negative, with italics and calligraphic lettering as in previous versions but in a more buoyant and graceful style. 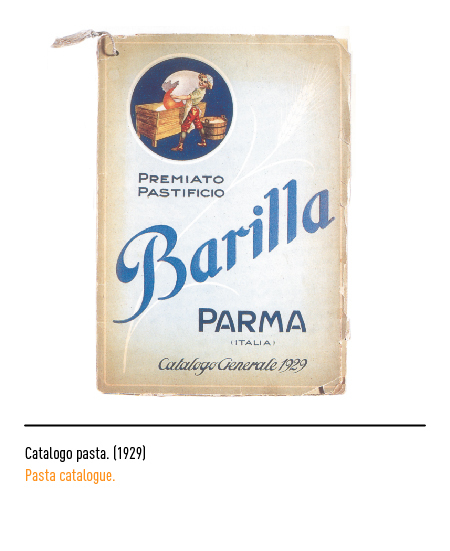 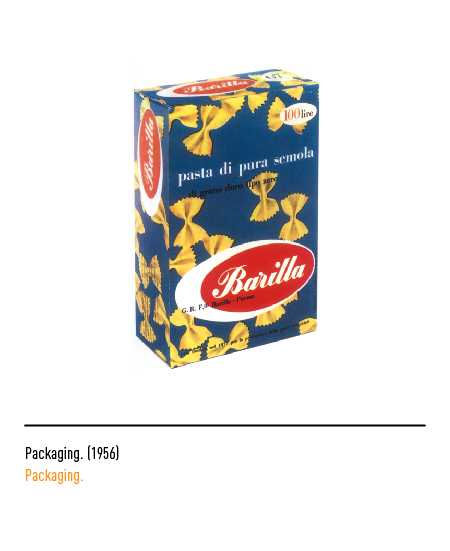 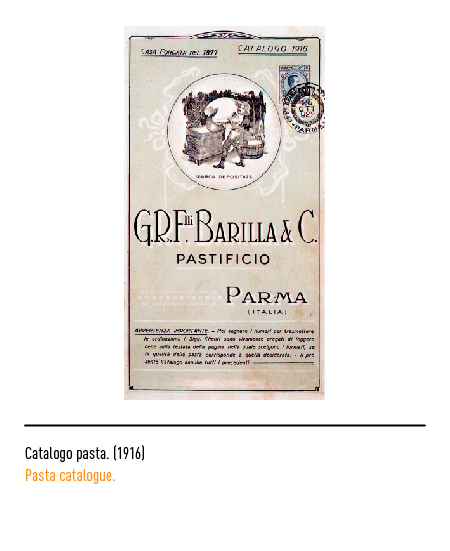 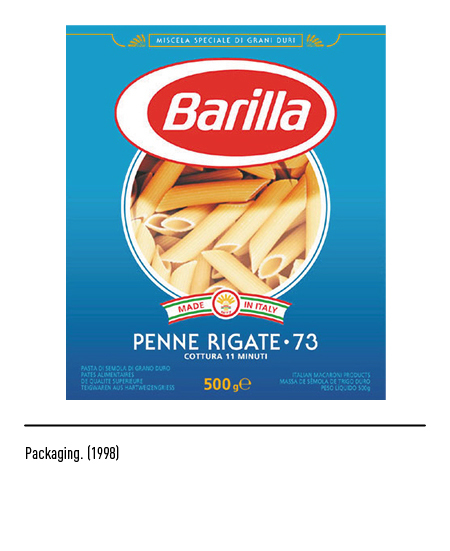 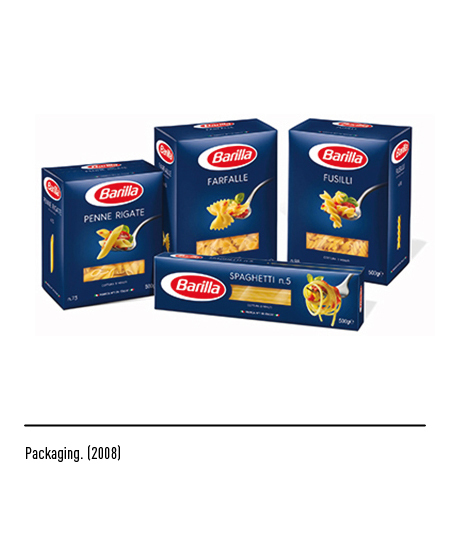 At the time, Barilla was the first firm to adopt a carton as standard packaging for the full range of its pasta products, that till then had been sold loose. 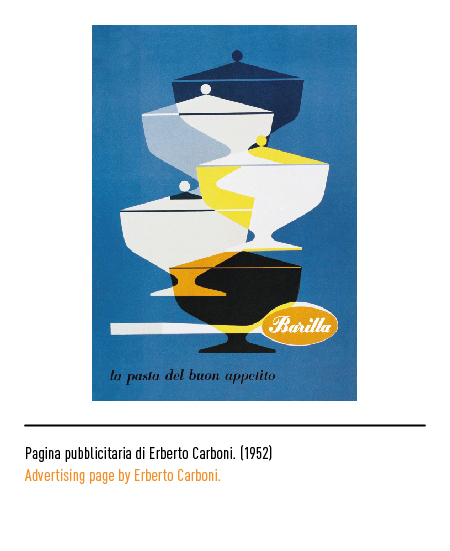 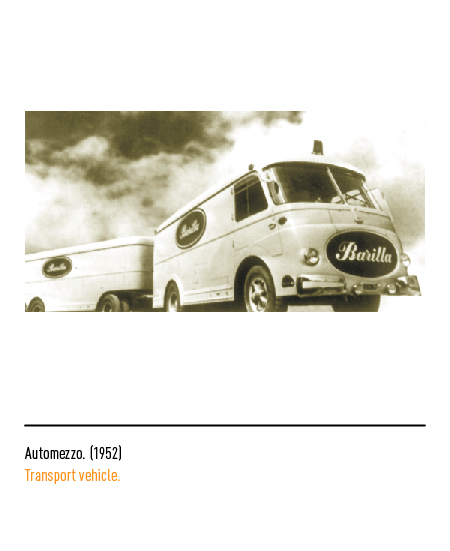 The trade-mark affixed to this carton was slightly restyled by Carboni in1954 by the addition of an asymmetric frame. 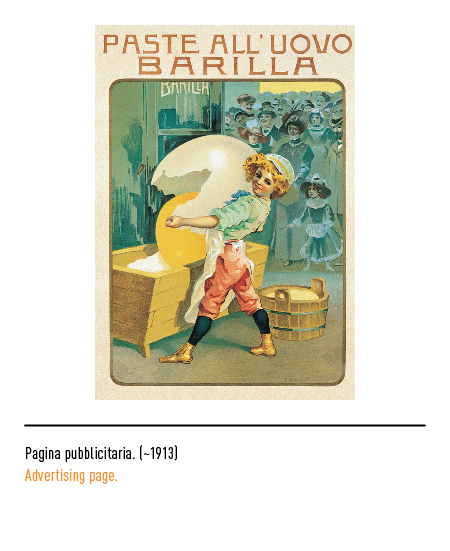 This new graphic touch was interpreted by some as symbolising the white and yolk of a hard-boiled egg cut in half, while others believed it to be the distinctive "white finger-nail" motif that had come to be associated with the firm. 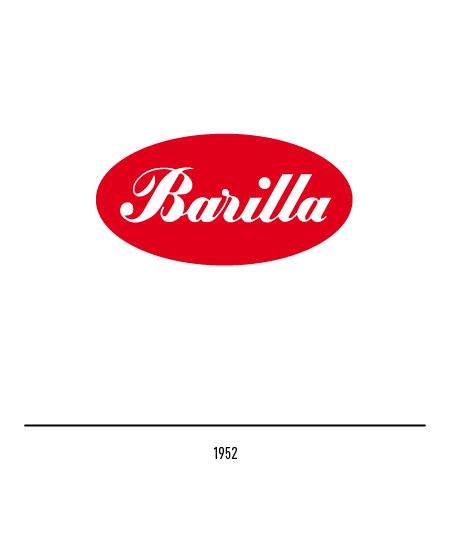 In 1960 Barilla was turned into a joint-stock company giving further impetus to become a leader in Italy in the food production sector and world leader in the production of pasta. 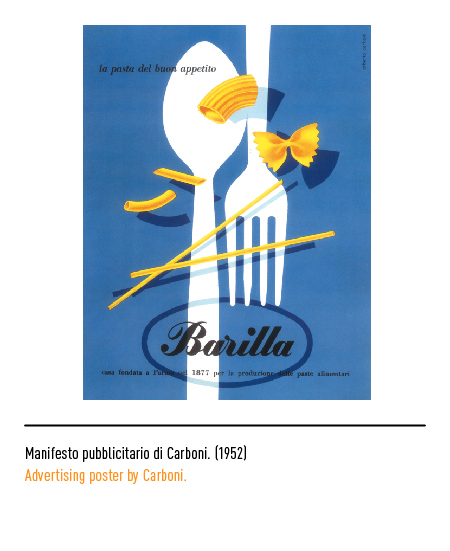 Carboni set to work to thoroughly revise corporate image. 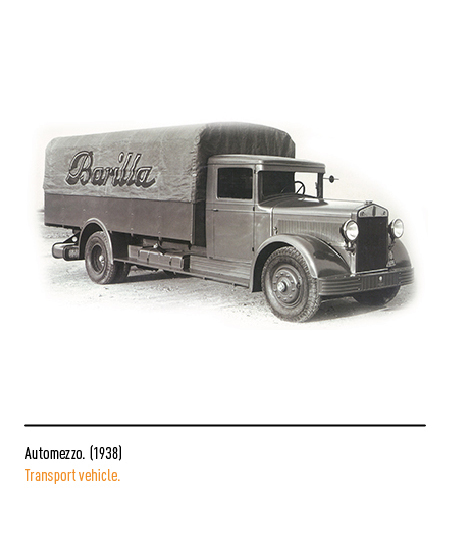 Changes were wrought to the packaging and new iconic devices were designed for press campaigns, trade far stands, and company fleet vehicles. 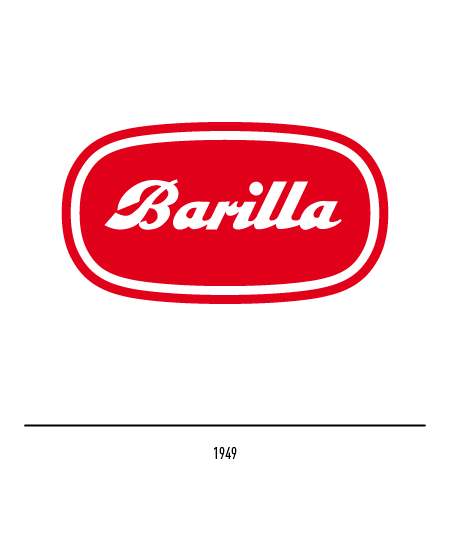 The slender, highly flattened elliptical trade-mark design with stylised lettering with which Barilla is identified today was designed by Lippincot & Margulies of London in 1969. 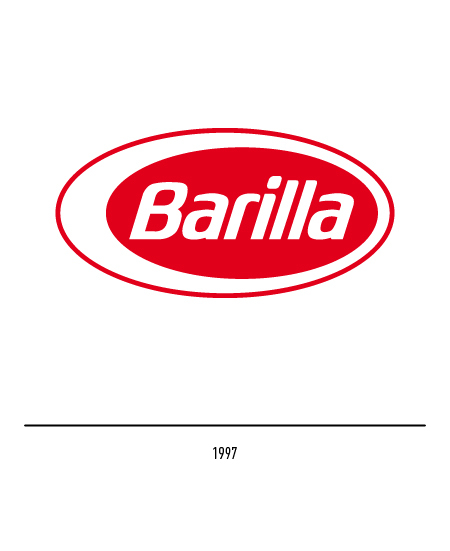 In 1997 slight changes to mitigate the over-emphasised horizontal layout of the trade-mark were made by Gio Rossi. 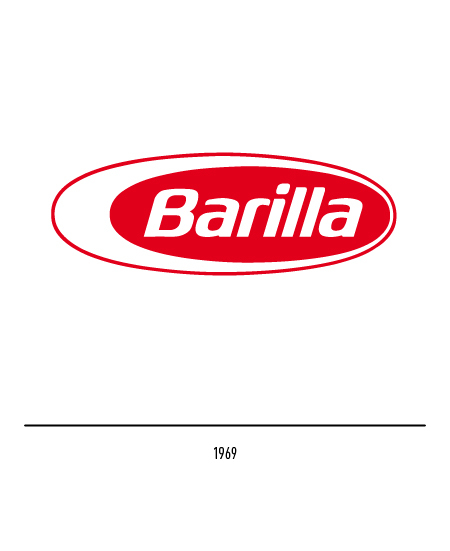 In 2000, thanks to Future Brand, the Barilla logo has been slightly revised to give more evidence of genuineness and simplicity; it has became more crushed. 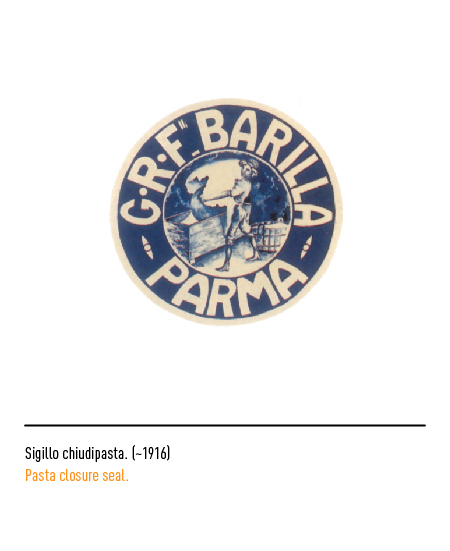 BARILLA Cento anni di pubblicità e di comunicazione, a cura di Albino Ivardi Ganapini e Giancarlo Gonizzi, Archivio Storico Barilla, Parma, 1994. 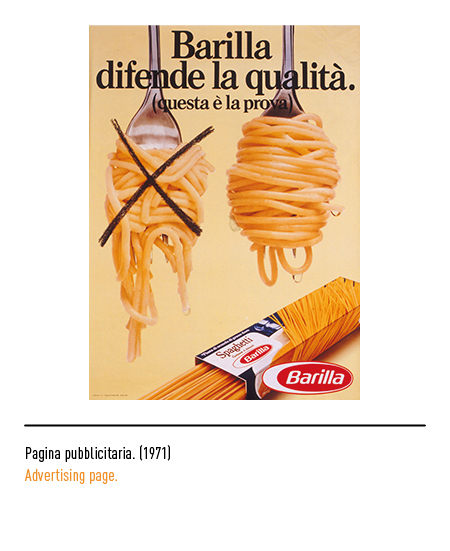 Valeria Bucchetti, “L’immagine in scatola” in Linea Grafica, n. 4, luglio 1994, Azzurra Editrice, Milano. 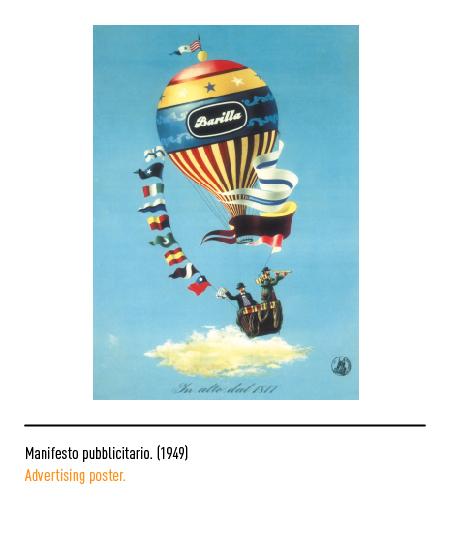 Giancarlo Iliprandi, Alberto Marangoni, Franco Origoni, Anty Pansera. 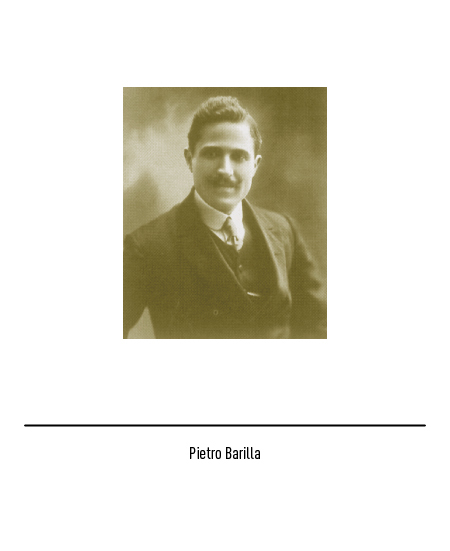 Angelo Calabrese, Camillo Capolongo, Luigi Castellano, Valeria Del Vecchio Pignalosa. 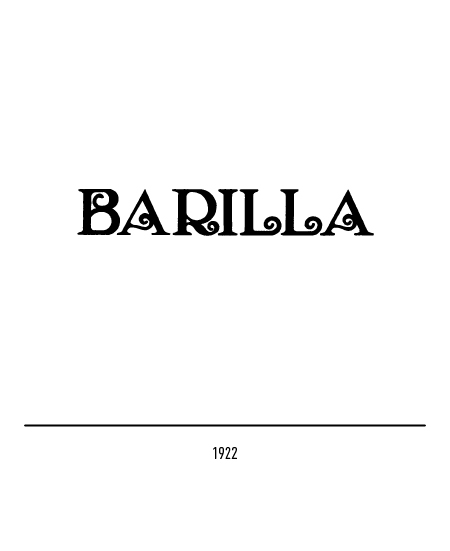 PIANETA BIANCO, Giovanni Paciﬁco Editore, 1998, Napoli.